BlueFish builds on the legacy, recommendations and consortium expertise resulting from the SUSFISH project, which focused on the biology of representative shellfish species in the Irish Sea. BlueFish will now apply this in a wider context, this time incorportating both finfish and shellfish species. Raise awareness of climate change issues and potential adaptation strategies through conferences, workshops and outreach activities aimed at involving local organisations in cooperative action and sharing best practice among coastal communities. As lead beneficiary Bangor University (BU) will lead the Project Management Work Package (WP1) to ensure delivery of the output indicators. A significant output for WP1 will be the cross-border conference on climate change and marine ecosystem health, held towards the end of the Operation. Click here for further information on conference and other events. Mapping fish / shellfish predators and how climate change will affect predators and prey. WP2 will interact closely with WP5 (Ecosystem Change – Modelling) to assess present and future predicted distributions and connectivity of key marine species, to inform how climate change effects on particular species may have wider ecosystem level impacts. Concentrating on three threatened marine resources, scallops, seabass and bivalve shellfish seed production, BlueFish will investigate where shellfish seed and juvenile fish may or may not be under predicted climate scenarios for the Irish Sea. This crucial information will inform guidelines for policy in terms of protection, potentially though Marine Strategy Framework Directive (MSFD). 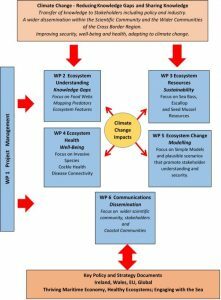 WP3 will interact closely with WP5 (Ecosystem Change – Modelling) to assess present and future predicted distributions and connectivity of these key marine resource species, and how changes will affect utilisation of the resource. The complexity of interactions between species and global climate change will require ongoing research and understanding. Currently temperature increases of a few degrees are altering major currents and thus species viability in estuaries and other coastal areas, reducing the resilience of the system to adapt. Improving our understanding of critical microbial processes is a major challenge for future research. The potential impacts of ocean acidification on marine biota is of concern. Research is required to improve understanding of the response to ocean acidification. Additionally, impacts from the spread of non-native species may, by climate change be enhanced. The aim of WP5 is to employ multiple modelling approaches to produce future pictures of ecosystem change and so provide a framework, against which the detailed actions under WPs 2-4, can develop ‘forward-looking’ adaptation guidelines, and best practice for environmental / economic sustainability of commercially important marine organisms in the Irish Sea. Using 3-D oceanographic models and ecological niche models, WP5 will develop a context for our understanding of the changing distributions and connectivity between shellfish, finfish and parasite / pathogen populations around the Irish Sea. Investigate how these distributions and connections might be altered by predicted climate change, effects on the physical, chemical and biotic environment in line with latest IPCC (RCP 4.5) scenarios. Outreach and communication is an integral part of this scientific programme. We will be using innovative multi-layered communication activities to reach local communities that we will be engaging with. Artwork and schematics to ‘demystify climate what climate change is’ and convey our science to the wider community. Online videos as well as web-based risk maps and illustrations will be produced, and then published here and on our Twitter feed. This work-package will be responsible for generating all workshops, as well as the conference.